At first glance, I thought that this brooch was a miniature frame or work of art. The sensual "Nouveau becoming French Deco" shape, the rich enameling and two colors of inset crystals truly make it a work of art. Measuring appr. 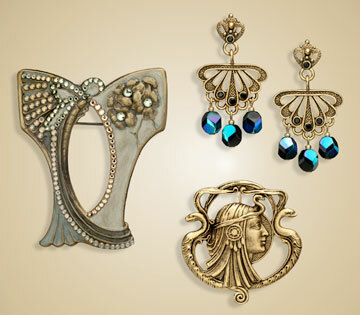 2-1/2" tall, it would be so appropriate for that vintage Edwardian or flapper outfit in your closet. It's an homage to Sarah Bernhardt's classic role as Cleopatra, and of course, the Egyptomania of the early 1920's after Howard Carter discovered King Tut's tomb. Originally created by the William Link Company in gold, our fabulously detailed replica (1-3/4" ) is made of gold plated pewter, antiqued to enhance the design. The dual back allows you to wear it as a pin or hang it on a necklace. The delicate Nouveau fan design of these 2" drop earrings (surgical steel posts) is also gold plated pewter, with the added touch of Bohemian crystals and rhinestones. The black crystals appear to be iridescent blue and shimmer like the aurora borealis and they'll match many outfits.